Office Max will open at 6:00 am on Friday. Many of these deals will be available online too starting at 4am Thanksgiving Day. Here is a sneak peak at the Office Max Black Friday Ad. Below are a few of the top deals from their ad. The ad will also have a few coupons on the bottom for special deals as well so you’ll need to make sure you take the ad with you. 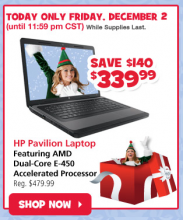 Offers Nov 20, 2011 in BlackFriday, OfficeMax · Expired!